Yes, this is the new toy I built! As of the beginning of december 2006, the standard version is completely assembled and aligned. New commercial transceivers are great, they have lots of bells and whistles but, have you ever tried to get a rig serviced that is 3 or more years old? If I’m not able to do it myself I think I have a better chance to find someone who can fix my K2. As written by Jeff Davis, KE9V in his blog:Think about it, when fully filtered to ‘better’ the K2 performance a user would have to spend $4400 for an Orion. That is SEVEN times the cost of a K2. The new Icom is a mere EIGHTEEN times more costly. The new Yaesu will no doubt have a similar price tag. But even then I had some doubts when I had ordered my toy…: Would I ever be able to get this rig up and running or would it end with the other junk in some dark dusty corner of my attick? I invested in a good temperature-controlled soldering station and a magnifier lamp. All other (small) tools were already somewhere in my shack, so I only had to gather them and put them in a few drawers so I could find them easily when needed. Finding solder within Elecraft specs was not very easy either (Radio-Shack has stopped its activities in Belgium ages ago…) but thanks to a hint from Peter from QRPProject I could find something suitable. De-soldering Primer (using your chin, etc.) if you stay up late to build your kit, you’ll certainly need this once in a while! Elecraft list archive I downloaded all the files and imported them in Thunderbird so it was far easier for me to search in these archives than through the web interface. When opening the package I was pretty overwhelmed, wow, this is a BIG project for me (yes the doubts began to rise again..). But, I also noticed the professional way everything was packaged in a few dozen different bags according to the use and type of components. As you certainly noticed on the website here, English is not my mother tongue but the manual seems clear enough for me to be able to finish this project. But it’s time you guys over the pond start to use metrics instead of the imperial system, those inches are pretty confusing to us (hihi). As in all user manuals there are some mistakes/updates but the K2-manual comes with a list titled ‘K2 KIT CHANGES AND MANUAL ERRATA’ so the first thing I did was go through the manual and made the necessary changes. The complete inventory took me a little less than 4 hours, but being a not so experienced builder, it helped me to get familiar with the different parts. This is also where I made my first mistake… I should have sorted all parts during the inventory instead of putting them back in the small bags they came in. This would have spared me a lot of time later on during the construction. If I counted correctly there are 867 parts in the basic K2 kit! And, not one part was missing! After sorting the components (yes I should have done that during the inventory…) I got started. These are also my first solderings with my new Weller station. I SHOULD HAVE REPLACED MY OLD SOLDERING IRON AGES AGO!!!! The construction starts pretty easily, with a few resistors and the difficulty rises slowly. Pretty considerate of the guys as Elecraft to put the resistors in a tape in the correct order you need them! It helps avoiding lots of mistakes! Except for a transistor I had to unsolder and put back in because it was too high above the board, no real difficulties here. The visual inspection and resistance checks show no problems. After sorting the components (yes again), I tried to figure out how the ‘pushbutton switch spacing tool’ worked. Great trick to get all those buttons aligned correctly! It’s clear the difficulty is increasing gradually. But, except for a litle fight with the double-backed tape for the green plastic bargraph filter, again no problems here. 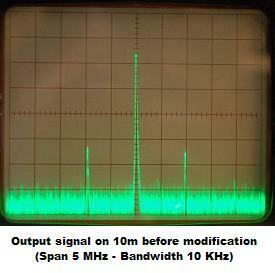 At least now it starts to look like a transceiver! Visual inspection and resistance checks OK.
Not too many components to mount in this part. This is the first time the Control Board, Front Panel Board and RF Board have to be assembled, and power has to be applied… Cross your fingers, say a little prayer, push the Power switch Mmm, no smoke?, wow! And the display says ‘INFO 201’ as it should. Switch it off, switch it on again and it says ‘Elecraft’. IT’S ALIVE!!!!! Time for a litle party! No problems encountered in the further tests and first alignments. Time to disassemble the different printed circuit boards and go on with the construction. This is the part where I made my second mistake… placed a capacitor in the wrong spot and had to unsolder it. Here most tricks of the De-soldering Primer mentioned above had to be applied. Of course the capacitor was destroyed in the operation and the local shop didn’t have any to replace it. Luckily there were some more of the same value in the kit and by the time I needed those the replacement had arrived from a mail-order company. The most dreaded part in the construction of the K2 must no doubt be the winding and installing of the toroids. I know, you can order them ready made from ‘The toroid guy’ but I wanted to have the full experience so I decided to wind them myself. I had to start over several times because I seemed to repeatedly tend to wind the wire in the wrong direction, but after a few tries all went well. I prepared the leads using the “solder blob”-method (look halfway down the page). After all, there is no reason to worry about those toroids, when you follow the given descriptions, everything goes pretty smoothly. All tests and alignments went according to specs, except for some doubts about the I.F. Amplifier Alignment for which I couldn’t really find the best position. A quick question through the reflector solved this. No problems encountered during this part of the construction. Upon visual inspection I noticed one forgotten soldering and I reheated a few solderings who looked suspicious to me. All alignments seem to go pretty well, using the limited tools at hand (Digital multimeter / RF Power meter / 50 Ohm dummy load / Fequency counter / PC with spectrumanalyser software). Nothing really difficult here, just a few connectors to mount, and before you know it you are at page 80 of the manual: “This completes assembly of your K2”. Hey, it’s finished already? I had so much fun building it that I almost regret it being finished. But, with some hints from Don W3FPR (Tnx!) we could trace back and found out the problem started in the buffer. When we decreased the gain of the buffer by adding a resistor of 1.5 kOhm parallel to R93 (820 Ohm), the spurious decreased with about 10 dB! After some more feedback from Don W3FPR and Gary AB7MY it seems this problem needs more investigation. No options ordered yet, but that’ll happen VERY soon, maybe, and who knows, Santa? I didn’t really encounter big difficulties while constructing this rig. The few questions and issues I had were VERY rapidly solved through the Elecraft forum (TNX guys, you’re great!). The doubts I had before starting have completely disappeared and I’m already looking forward to construct another (Elecraft?)-kit. 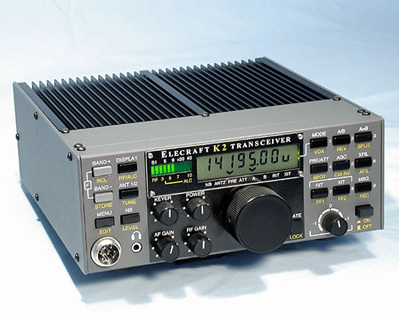 I have Elecraft K2/100 serial number 1903 but completely upgraded with hardwares and software. It is a line with K2/KAT2 + EC2/KPA100/KAT100 + XV50. A wonderful radio, I am using it daily. The most significiant mods was the KPA100 and the improvement of the key shape.